Transmitter calibration requires meticulous preparation. In the preceding post, we have discussed basic setups for calibrating a pressure transmitter. 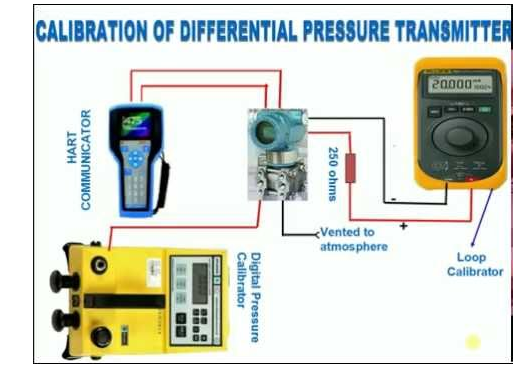 Here we will discuss how to proceed with pressure transmitter calibration. Calibrate the 0%, Lower Range Value (LRV) of the transmitter to the LRV of the calibration range. Calibrate the transmitters span to 100%, Upper Range Value (URV) of the calibration range. For example: If you are using DP transmitter with power output 4-20mA to measure pressure in the range 0-300 PSIG, then the transmitter’s 0% LRV is 4mA, and is calibrated to 0PSIG. Similarly, the 100% URV is 20mA, and will be calibrated to 20 mA. Locate the ZERO and SPAN/RANGE screws of the transmitter by referring the instruction manual. These screws are each connected to the potentiometer and can be turned easily. The potentiometer allows up to 20 turns between the maximum and minimum resistance. This means 20 clockwise or anticlockwise turns of ZERO and SPAN screw will cause the potentiometer to be at maximum or minimum. In many brands of DP transmitters, the ZERO and RANGE adjustments are interconnected. This means adjusting one screw may affect the other. Turn the RANGE and ZERO screws clockwise 20 times. Next, turn the screws 10 times in the counter clockwise direction to adjust the potentiometer between the maximum and minimum resistance. This step is performed to set the mid resistance point at 50%. Apply the LRV 0% on the high side of the transmitter, and low vented side. This helps diminish the differential pressure across the DP cell of the transmitter. Adjust the ZERO screw on the transmitter by observing the 4mA indication in the current meter. This is the LRV output of your transmitter. At times, this value may not be 4 mA, but you should get a value closer to that. Next, apply pressure on the high side of the transmitter to increase the value to the 100% higher value (URV) of the calibration range. Adjust the RANGE Screw by observing the meter’s current indication, which should show 20 mA, which is the 100% URV output of the transmitter. In ideal situation, 100% of the transmitters input should correspond to the set standard readings of transmitters 100% output (4-20 mA). Accurately calibrated pressure is the one, where the values of input equals to the output for all values between 0-100percent. The procedure is complete if you find that input and output values are same as expected. If you are not satisfied with the results, you should continue fine tuning the calibration process, until acceptable levels of accuracy is achieved. The steps mentioned above may differ from the actual steps mentioned in the manufacturer’s guide, however they will help you understand the procedure.